As the mother of two little boys, I have seen my fair share of dirt, grime, food and other stains on clothing. There have been times that I have actually "retired" some clothing because things do not come out after using our normal strain removing tactics. Friday night, when NHL took off the shirt I sprayed it with our usual stain spray. This is one that can be left on for a while before washing. Sunday, I did the laundry. When I pulled it out of the wash, some of the paint was still there. Can you see fumes coming from my ears? Well, that is when I kicked myself. I had just received some new samples of OxiClean Max Force Pre-Treater Gel Stick and Oxi Clean Max Force Laundry Strain Fighter & Booster Power Paks. Ooops! I opened up my pre-treater, read the directions and set to fight that stubborn stain. I really liked that when you pushed down, just the right amount of gel came out. The nubs on top were great for helping to rub the gel into the stain. Then I went to the basement to change from cold water to warm (instructions said that works best) and waited to see what happened. BTW – Another brain issue. I goofed and turned on the machine and forgot the Power Paks upstairs. Oy! This winter, OxiClean announced two new products to add to your stain-fighting arsenal: OxiClean Max Force Power Paks and the Max Force Gel Stick Pre-Treater. You can use the Power Paks to give any load of laundry – whites and colors both – a boost, without dealing with messy liquids or powders. The Gel Stick Pre-Treater works best on tough stains – even ones that set-in on clothes for a week! Just rub the gel into the fabric and let it sit for a few minutes before throwing it into a normal load of laundry. Each of these new products contains OxiClean’s "4-in-1 stain fighting power" so whether grease, oil, blood, or dirt, appears on clothing, you know that dabbing with OxiClean will leave the garment looking new again after just one wash. When I took NHL’s paint stained sweatshirt out of the wash, the stain had faded more. Much less noticeable, but still there. I can not fault OxiClean at all since the item had previously been washed and dried. Next time, we have another stain pop up I will be sure to use the Max Force Pre-Treater directly on the item and toss the Power Paks (now downstairs so I will not forget). I will update how that goes in my comments here. 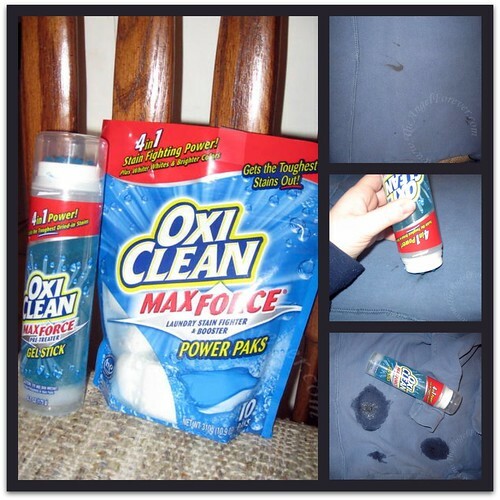 I know one thing, we will be buying more OxiClean because I liked that there was not a harsh scent, it worked to reduce already set in stain and has worked well on carpet stains over the years. Oh, I will also be tossing the OxiClean Pre-Treater in a bag to go to Disney World with us. Quick and easy vacation stain fighting is what I am all about! Disclosure: I wrote this review while participating in a blog campaign by Mom Central on behalf of OxiClean and received a sample to facilitate my candid review. Mom Central sent me a gift card to thank me for taking the time to participate. Try the regular Oxiclean on the shirt. I use the powder mixed with hot water. It works great to take out set stains – when Zach was a baby I took clothes that were Alex’s out of storage. They had been in plastic tubs for over 3 years. Stains I didn’t know existed when I packed the clothes away were now visible, and a few soaks in Oxiclean took them right out. Not only had they been washed and dried several times, but had also sat unused for 3 years! It’s amazing. .-= Nancy´s last blog ..WW =-. Sweet….good to know, thanks for telling about oxiclean’s new product. I am a single mother of 3 boys, oh man! It gets quite messy around here, so anything that makes cleaning faster or easier, is truly a life saver.